The north-eastern quarter of the continent of Africa is drained and watered by the Nile. Among and about the headstreams and tributaries of this mighty river lie the wide and fertile provinces of the Egyptian Soudan. Situated in the very centre of the land, these remote regions are on every side divided from the seas by five hundred miles of mountain, swamp, or desert. The great river is their only means of growth, their only channel of progress. It is by the Nile alone that their commerce can reach the outer markets, or European civilisation can penetrate the inner darkness. The Soudan is joined to Egypt by the Nile, as a diver is connected with the surface by his air-pipe. Without it there is only suffocation. Aut Nilus, aut nihil! The town of Khartoum, at the confluence of the Blue and White Niles, is the point on which the trade of the south must inevitably converge. It is the great spout through which the merchandise collected from a wide area streams northwards to the Mediterranean shore. It marks the extreme northern limit of the fertile Soudan. 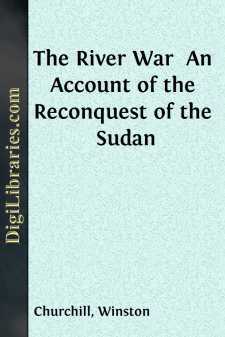 Between Khartoum and Assuan the river flows for twelve hundred miles through deserts of surpassing desolation. At last the wilderness recedes and the living world broadens out again into Egypt and the Delta. It is with events that have occurred in the intervening waste that these pages are concerned. The real Soudan, known to the statesman and the explorer, lies far to the south—moist, undulating, and exuberant. But there is another Soudan, which some mistake for the true, whose solitudes oppress the Nile from the Egyptian frontier to Omdurman. This is the Soudan of the soldier. Destitute of wealth or future, it is rich in history. The names of its squalid villages are familiar to distant and enlightened peoples. The barrenness of its scenery has been drawn by skilful pen and pencil. Its ample deserts have tasted the blood of brave men. Its hot, black rocks have witnessed famous tragedies. It is the scene of the war. This great tract, which may conveniently be called 'The Military Soudan,' stretches with apparent indefiniteness over the face of the continent. Level plains of smooth sand—a little rosier than buff, a little paler than salmon—are interrupted only by occasional peaks of rock—black, stark, and shapeless. Rainless storms dance tirelessly over the hot, crisp surface of the ground. The fine sand, driven by the wind, gathers into deep drifts, and silts among the dark rocks of the hills, exactly as snow hangs about an Alpine summit; only it is a fiery snow, such as might fall in hell. The earth burns with the quenchless thirst of ages, and in the steel-blue sky scarcely a cloud obstructs the unrelenting triumph of the sun.